The land, on which Anand Rishiji Hospital is set-up today, was reserved once upon a time for the slaughter-house purpose by the Ahmednagar Corporation. 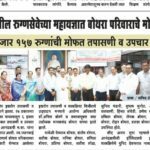 The Jain Social Federation has took initiative and after putting a lots of efforts the purpose of land has changed from killing the life to saving it. 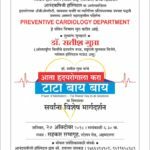 Anand Rishiji Hospital has a record of dedicated patient-care in Ahmednagar district and adjoining districts and other close by States for the last more than one decade. Anand Rishiji has carved an apt position in the Ahmednagar city’s history for its dedicated medical service. Anand Rishiji Hospital has been well known in and around Ahmednagar city for its unbending commitment towards poor, needy and destitute patients. Our few socially committed personalities having a very busy schedule of individual business background, came forward and promised to Jain spiritual Mentor, the inspiring Guru – Pujya: Aadarsh Rishiji Maharaj Saheb to strive for the Mission of the Rashtra Sant Acharya:Anand Rishiji in the field of healthcare for the poorest to the poor. 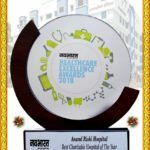 In order to achieve the goal and objectives of the management and to work as a team to serve and comfort the needs of the patients, through planning, and implementing the healthcare activities in the tune of Infrastructure, New Technology and skilled human resources, the management has shouldered the responsibilities to hospital Administrator – Dr. Ashish Bhandari who is young , energetic , enthusiastic and well-equipped with the knowledge of medical profession and hospital management-administration background. He and his team of hospital human-resources are working round-the-clock to render the best medical services to the entire satisfaction of our patients and their families.